Ah, Mario. It's been a while... believe it or not it's been five years since Mario's last personal outing; Super Mario Sunshine on the Gamecube. Our hero has returned for his first Wii outing, in the form of Super Mario Galaxy. Let's get something clear from the start: Galaxy is definitely not a straight forward successor to Sunshine, and that's a good thing. For me at least, Sunshine was good but way off great, something we've come to expect from Miyamoto and Mario. You haven't played anything like Galaxy, that's fact. Miyamoto's genius has once again pulled out all the stops to create a entirely new Mario experience. What's his new play toy? Its quite simple... gravity. The Japanese developers have created a traditional 3d platform game with a huge emphasis on gravity, this concept is quite hard to explain in words, so you'll just have to play it to see what I mean. As with any Mario game, the story doesn't really play a huge part... but what has Bowser done this time? Not to our surprise, he's kidnapped Princess Peach.. and recruiting the help of some UFOs he's managed to transport Peach's entire castle into outer space. The standard stuff, although we are treated to a so-so cut scene showing our princess being abducted by the villain. 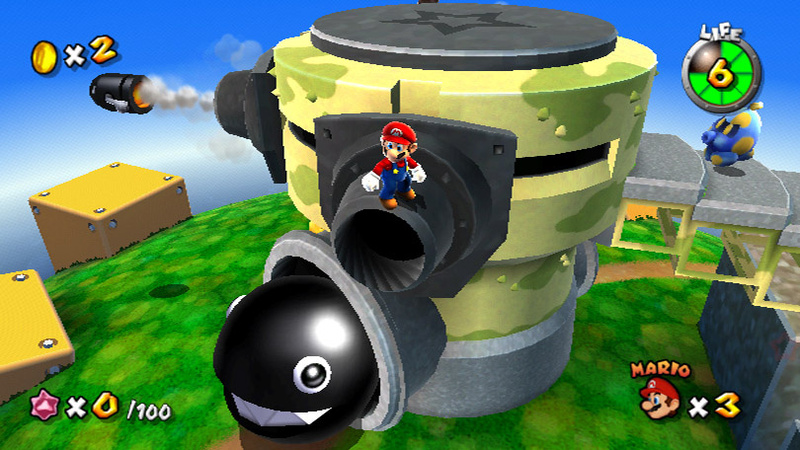 When I first saw footage of Mario running around these tiny spheres I had quite strong doubts in my mind as to how it was going to work- what happened to the large 3D environments we're used to? My fears were almost instantly put to rest as I started to play Galaxy. 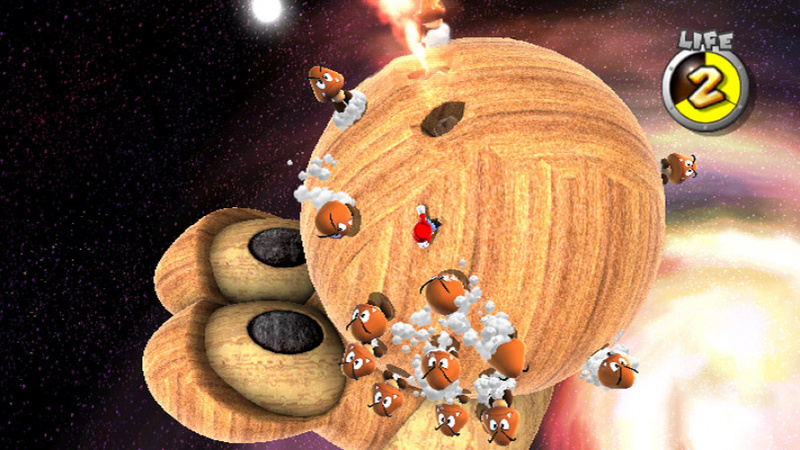 Straight away gravity becomes Mario's closest ally as he jumps effortlessly between planets. 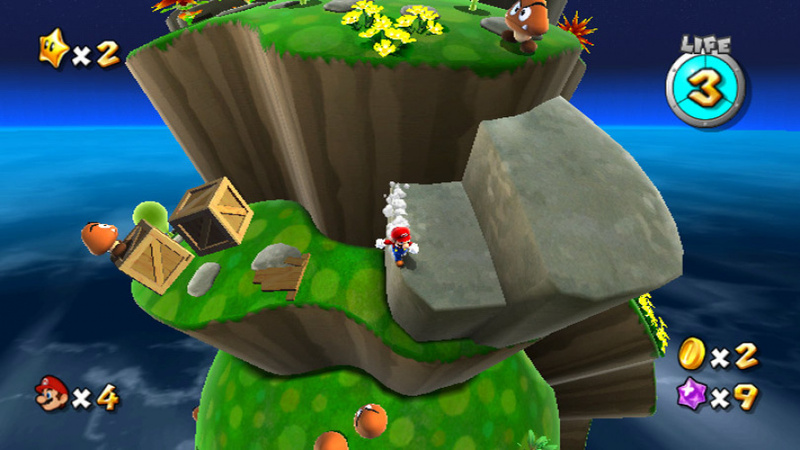 Once you've picked up the controls, which can take a little getting used to, seeing as you can now walk upside down, and caught a few pesky rabbits, you find yourself aboard the observatory- the central hub of Super Mario Galaxy. It's worth pointing out that this hub is nice and small unlike those of other recent platformers. Scattered around the observatory are a number of domes, each dome grants access to a number of galaxies, and each galaxy has a number of stars available; these are the actual levels. 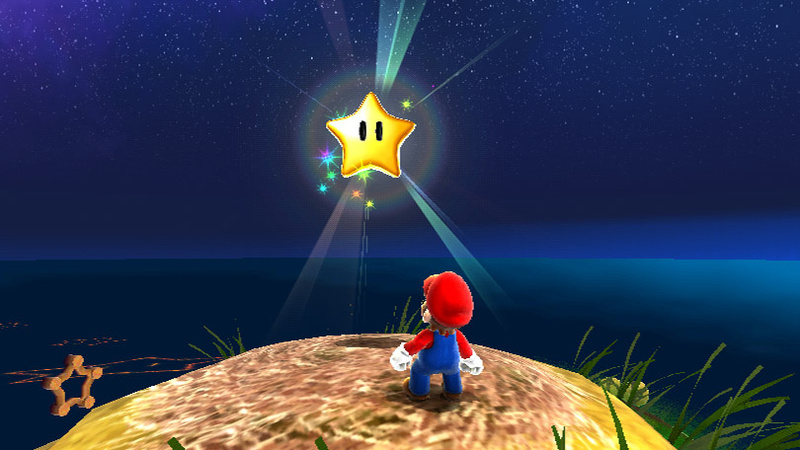 Collecting stars is the name of the game, each level you complete gains you a star, and defeating a boss gives you a grand star which usually opens up another dome's worth of galaxies. Simple. What the Dickens do I need stars for? For Mario, gaining 60 power stars will allow him to travel to the center of the universe to save his 'gal. That's right, fortunately for our hero it only requires 60 stars to initially finish the game.. however, there are an additional 60 stars available to complete the game and unlock a special reward. 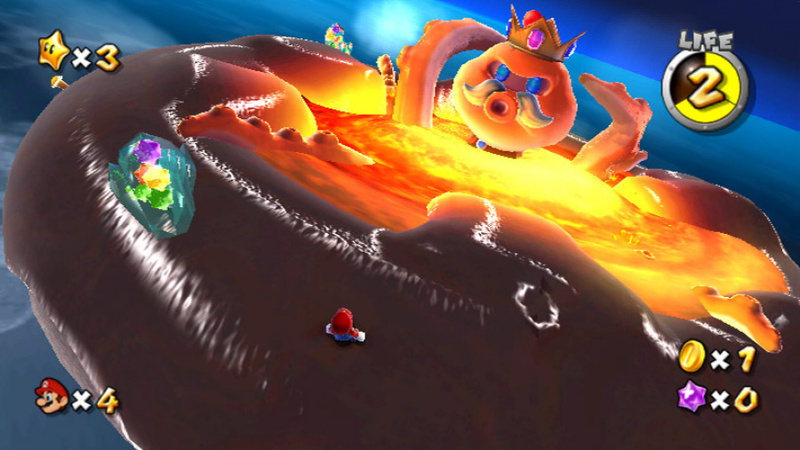 Super Mario Galaxy is the truest 3D platform game I've come across since the original Mario 64. It has deep roots in platform action, not adventure.. I can't stress enough that this is not an adventure game. Sunshine sometimes felt like you were just running around collecting stars, Galaxy is so much better, every single level has been designed with platforming/puzzle/action in mind- obviously they vary in difficulty, but the bottom line is that platforming Mario is back and better than ever. Along with difficulty, the level design also varies considerably along the way... sometimes you'll have a level spanning up to twenty tiny planets and others will simply be on one large planet. The classic “ice"and “fire" worlds are present along with the “haunted mansion", all in addition to new areas like dreadnought planets and bee hives. Mario has also never had so many upgrades, even the “mega mushroom" is back, doubling your life from 3 hits to 6. Mario can now skate on ice, fly as a bee, disguise himself as a ghost, walk on a giant ball, freeze water with his feet, ride shells underwater, coil himself like a spring to achieve super jumps, and even shoot fireballs just like his Mario Bros days. As usual with the infamous Nintendo Polish™, Miyamoto's team have presented the game with near perfection; the music, animation and graphics all pull together and produce the richest and most enjoyable Mario game ever. If I had any slight criticism of the game, the very first area in the prologue did feel slightly rushed, but little did that matter as the graphics and environments continued to get better and better the further into the game I played. Super Mario Galaxy is a fantastic game, a game that displays Nintendo's continuing ambition to explore the possibilities of a 3D platformer, something that no-one else has really managed to do. It's considerably better than Super Mario Sunshine on all accounts, with the new emphasis on gravity it becomes once again a game that requires skill and timing rather than just an exploratory mind. This will be an instant hit and surely go down as one of the best Mario games. A must have for all. This really does look outstanding. I've hardly touched the Wii lately and this will defo be the game to win me back. From what I can tell Nintendo have created a proper platform game unlike Sunshine which aside from the retro themed levels wasn't too great. I can't wait for this one! Great review guys! For Ant to give something a 10/10 is reason enough for me to want to buy it, twice! I will be popping down my local store and getting this one on Sat- cant wait! I can't wait either, going out to pick up my copy, hopefully later Today. I've been waiting for this game for a long time too and have seen a lot about it but could never be bothered to pre-order it like with many games and games consoles that I never do. It really does look quite amazing and it's about time the Wii got a good and proper Mario game for it. Well I picked my copy up, and man what can I say...this game is just what I have expect from Nintendo. In all honesty this should have been a launch title for the Wii last year, but better late than never. The game looks very good, and I wish all the games from now on will look this good on the Wii, and it is just addicting and pure fun. A must buy for Wii owners and obstacle/platform game fans! You've given me a tough choice now. I was going to buy FIFA 08 but now I'm wondering whether to buy this instead. Brilliant review. Its ok.....but a bit boring.......first 50 levels or so are far too easy.....then some of the levels are just damn frustrating due to the less than perfect control scheme..i.e. the swimming, the toy factory levels etc etc. 10 !10! 10!......here I am...playing a game which reminds me in 1996, playing Super Mario 64...with awesome stuff, music, gameplay...etc. Super Mario Galaxy is essential. Everyone must buy this game. It's funny and cool. Such a low score! This deserves at least a 14/10! I'd give it an 8, style over substance, Mario 64 was so much more fun, the total linearity kills the exploration and doesn't allow for any creativity to take shortcuts and such. 10 all the way by this sites scoring system. Better than 64 for definate IMHO. This game is the best! LOVE IT! SO COOL! BETTER THAN SUPER MARIO 64! 178/10! The best Super Mario game since World, and the best 3D Mario ever. I just started playing again and I love every minute. It's beautiful in every single aspect, and it's reminded me why I love Mario in particular and video games in general. If really does deserve a perfect score; it's that good. @MatTheCat You think it's boring??? I respect your opinion. But I don't agree with you. For me, this is the best Mario game on the Wii. Really fun to play. My god. Galaxy is just pure win. Talk about revolutionary. After getting every single star in this, I was motivated to DL every Mario game from the VC and played through all of them. I didn't enjoy Galaxy that much, to be honest. I think it was the controls, in the way that you've run around planetoids, which was kind of annoying (I guess I'm just too used to the 2D Mario games, and I wasn't much of a fan of Super Mario 64), it also seemed a little too easy. The graphics are amazing (for Wii), can't argue with that, but I wouldn't go to say this deserves 10, more like 8. Awesome game! Certainly better than 64. My favourite Ninty game of all time. @18: It truly deserves a 10/10. One of the best Mario games ever made, even better than the legendary Super Mario 64. This game truly deserves a 10 in every possible way, from graphics to gameplay. The best Mario game yet (although NSMBW and SMG2 might surpass it). Even reviewers who dislike the Wii, love this game. I LOVED SUNSHINE SO MUCH. Why the hate? Sunshine is sometimes better than Galaxy in gameplay... I guess only a true Mario fan would know. The boss battles and the real difficulty of Sunshine make it so rewarding. Super Mario Galaxy is overall better and one of the greatest games ever made. I would rate Galaxy a 10. And Sunshine a 9.9. But don't hate on Sunshine, it paved the way for Galaxy in many many ways. Galaxy 2 looks so amazing. super-nintendo: The boss battles and the real difficulty of Sunshine make it so rewarding. I personally agree. But I'm stuck at about 98 Shines grabbed. I might want to go back and redo the whole game again. Man can't wait, I want a Wii mostly for the awesome Mario games! Can't wait! You didn't give enough attention to the EPIC MAIN THEME. Gee, I hope there's a Galaxy stage in the next Smash Bros.. And Galaxy music... and assist trophies... and items... Just don't make Rosalina/Lumas a character, and I'm happy. Ok only 33 comments. It's either every gamer is playing galaxy 1. Or their in line for galaxy 2. BTW I loved sunshine more than galaxy 1 and probably galaxy 2. But Nothin can beat 64. Galaxy 2 is even better than this, trust me. I'm one of the few that don't like the galaxy games, I just like the nice flat areas and floating islands, messing with gravity, some of the motion controls, and what I think is overly cartoony design, it doesn't do it for me. Brilliant game! Although, I wasn't crazy over the hub world, and I wish the controls were a tad more quick and zippity. The Boss battles could of also been a smidge more challenging too. But overall this game is a masterpiece and definitly is deserving of a 10/10. 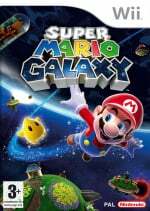 Though I think Mario Galaxy 2 is worthy of it's name, I think this game still beats it by a hair its just an amazing game. I can't..... I can't say it.... but..... AWWWWW, I think this one is better than SMG2 cuz its levels are more interesting and it has a little more interesting items than the latest game, such as Ice Mario and Flying Mario. 10/10. Even Game Informer appeared to like SMG1 better than 2 according to Metacritic. Game Informer gave 1 a 98 (9.75) and 2 a 93 (9.25). I love the galaxies because they are cool. "It's considerably better than Super Mario Sunshine on all accounts..." Not in my opinion. Nor is the second.